You can be in Highgate or on the Heath looking down at the City and west end and see what looks like a layer of smog. 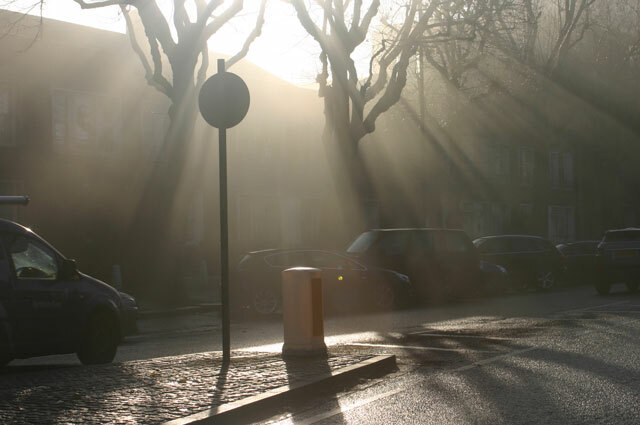 There are widely-reported health warnings, with a major one in April this year, and a quick online search for London smog images reveals eerily beautiful images, many taken from Highgate. We hope it might just be mist. Or, if it is pollution, that it is limited to the centre. Traffic trundles through our local streets but we cling to the idea that the air is cleaner than it is in town. The Forum would like to do some testing to find out just how clean Highgate’s air is. Highgate has been known for its clean air since records began and that fuels the sense of good fortune of being in Highgate. The online version of Edward Walford’s 1878 book “Old and new London” is worth reading. It quotes John Norden‘s “Speculum Britanniæ” from around 1600 which bears testimony to the healthiness of this locality. The Clean Air Acts of sixty years ago have transformed the situation but London’s streets do not always smell sweet. Smog has been replaced by traffic pollution. There’s a nice piece by the London Forum for Science and Policy on the legal background of clean air. The Forum wants to understand the situation around Highgate so will be launching an exercise to monitor the air. We will be following up on and updating work by The Green Party in 2013 – their full report is here and shows that many streets have levels that are too high. The Hampstead Forum has embarked on a similar project and we will link with their data to get a good feel for pollution in the area around much of Hampstead Heath. A pity not more is made of this serious health issue in the Forum report. For example, why not include the 2013 figures, particularly now that the diesel (NOx) measurement scandal has been uncovered. In July this year, I returned to Highgate after 24 years abroad and my eyes have not stopped watering ever since. And not only because I’m overcome with emotion at being back! So Archway Road is not really a very good place to construct more new apartment blocks…. It’s a very good point. Hopefully we can get the results of our tests in time.